Join us as we travel back in time to the 1930s for an evening of murder, mystery and mirth in the world of ‘Downton Abbey’. Help 368 Theatre Company solve the baffling case of Lord and Lady Pollock of Boothby Hall in ‘The Fall of the Pollocks’ and maybe even win a bottle of bubbly! 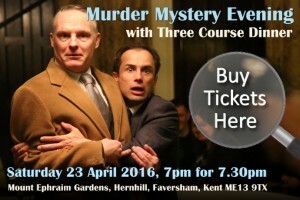 The murderous events will take place on Saturday 23rd April 2016, 7pm for 7:30pm at Mount Ephraim House, Staple Street, Hernhill, Faversham, Kent, ME13 9TX (parking will be available on the estate). As soon as you enter the venue, colourful and entertaining characters (played by professional actors) welcome you to your tables and into a fictional world of mystery and intrigue. During your delicious three-course dinner from Corinne’s Creative Kitchen (Taste of Kent award winner), you will meet the suspects and have the opportunity to pose your own questions, as gradually the drama unfolds. During coffee, you are invited to fill in your murder enquiry form, and then, in true Agatha Christie style, the murder is re-enacted and an accusation made. At the end of the evening, the table that gets the most clues wins a prize. Tickets cost £35, with all proceeds going to Khushi Feet, helping to provide an education for children living on the streets of Kolkata. Tickets will be on sale from Friday 5th February. Buy your tickets here! We look forward to welcoming you to Mount Ephraim for an evening of murderous fun! “368 Theatre Company stage a stunning performance which cleverly combines some serious and convincing acting with a light, soufflé style approach. Very appropriate.” WEST SUSSEX COUNTRY TIMES, November 2010.